Lounging in the sun, eating ripe fruit until you’re sticky-fingered and satiated, is one of the loveliest indulgences of summer. I’m going through peaches, nectarines, and cherries like there’s no next summer, but there is one fruit that will distract me away when nothing else does: apricots. Is it their sadly short season that makes them all the more desirable? Whatever it is, I do my happy dance when I see them show up at the farmers’ market, and I put all my other fruit-eating plans on hold until I’ve gotten as much of these velvety jewels as I can. Although ripe apricots are perfectly good fresh (the scrumptious Candy Cots come to mind), apricots really blossom (so to speak) when cooked. Heat intensifies their outrageous, ambrosial sweetness and also releases their heady fragrance. Think simple apricot tarts or galettes, or apricots simply roasted or poached and eaten with vanilla ice cream. They need so little to take them from delightful to divine. Since I’m a advocate of doing as little as possible to ripe summer fruit, and I was looking for something to cool me off over the sultry weekend, I decided to make some quick popsicles. This is my take on the classic creamsicle: apricot-and-lemon-verbena pops. The apricot portion is simple as can be: just apricots cooked briefly on the stove to soften and the resulting puree lightened with some simple syrup. I wanted to get as much pure apricot flavor as possible. To contrast with the rich sweetness of the apricot, I picked lemon verbena, another of my summer favorites. It also smells fantastic, and its citrusy-herbal flavor immersed in a creamy base makes a refreshing counterpoint to the apricot. You don’t know how excited I was when I hit upon combining two of my favorite flavors of summer. 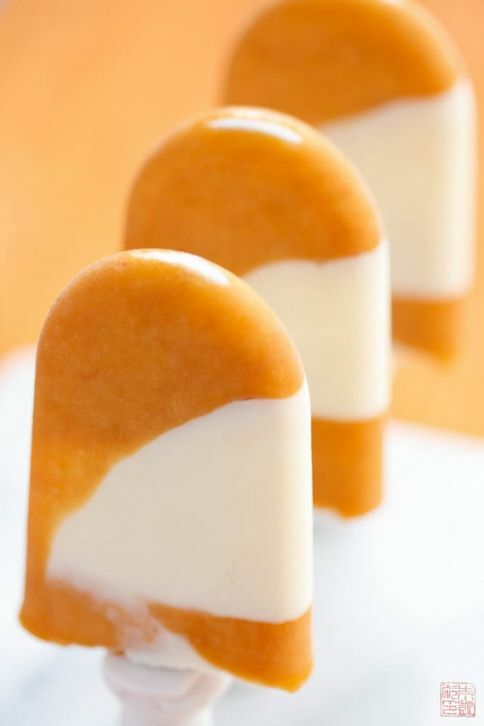 I layered the apricot and lemon verbena bases in a Zoku pop maker, which worked perfectly fine, but of course you can make this the old-fashioned way with regular popsicle molds, or paper cups and popsicle sticks. I did get some very interesting feedback on these popsicles: upon feeding one to the husband, he proclaimed he liked the apricot portion but didn’t think the lemon verbena side was sweet enough. Given my super-high sweet tolerance, it has never happened before where he found something lacking in sweetness before me! It was enough to make me wonder if I’d lost my edge. 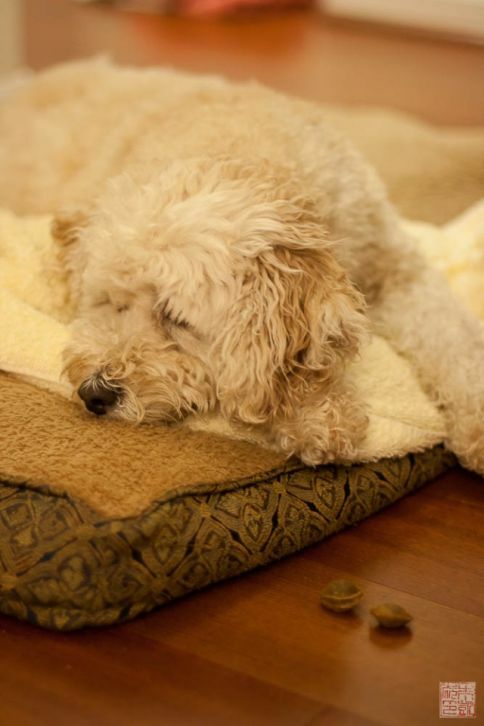 We decided that maybe it was the herbal notes of the lemon verbena that were throwing him off. While I’ve never found anyone to not like the taste of lemon verbena, if you choose to go without for a more conventional creamsicle, a few drops of vanilla extract will work just fine, or perhaps some lemon peel added to the cream. But I think apricot and lemon verbena is a lovely combination worth trying – they were certainly exactly what I was looking for that golden weekend afternoon. Place apricots and 1/3 cup sugar in a small saucepan. Cook over medium-low heat, stirring often, for about 5 minutes, until sugar is melted and apricots are soft. Turn apricots into a food processor and process until smooth. Strain if desired. Heat remaining 1/2 cup sugar and water together in a small saucepan until sugar dissolves and mixture comes to a boil. Add about 1/4 cup of the sugar syrup to the apricot puree to thin out mixture. You can add more to taste. 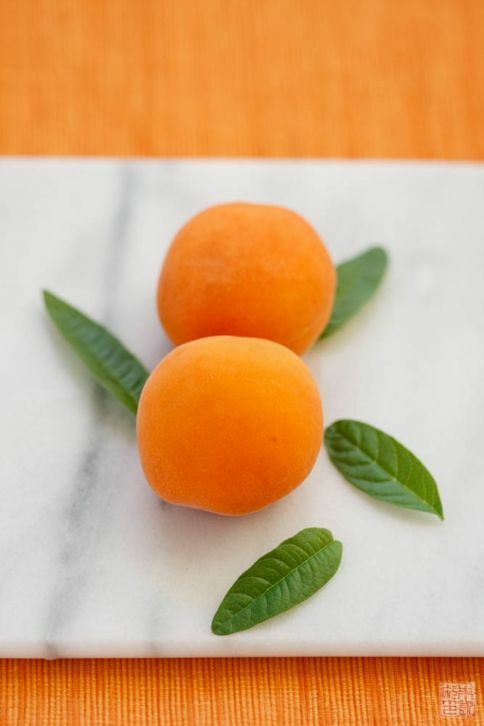 Chill apricot popsicle mixture while you make lemon verbena popsicle mixture. Combine milk, cream, sugar, and lemon verbena leaves in a medium saucepan. Heat on medium until sugar dissolves and mixture starts to bubble. Remove from heat, cover, and let steep for about an hour. Strain leaves out of mixture and chill. Prepare popsicle molds or paper cups. Fill one-third full with apricot mixture and freeze until set. Fill second third of molds with lemon verbena mixture. Freeze until set. Fill remainder of molds with apricot mixture and freeze until set. I too love apricots. The flavor is amazing, even if sometimes the texture isn’t. I’ve actually found myself liking them more than peaches lately, which is completely unheard of for me. Wish apricot season and summer lasted forever. I love apriots! 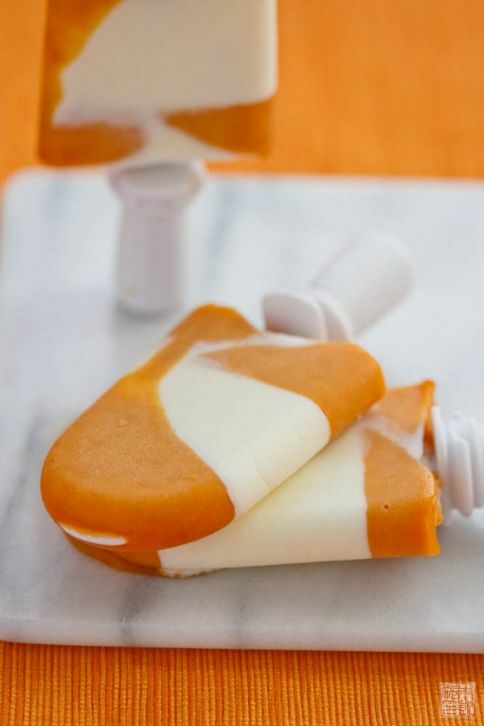 Naturally, this popsicle combination is tempting me! how pretty! i love apricots!! perfect for summer! I just discovered your blog and am really enjoying it. It is very inspirational-I want to make everything! I would love to know where you found the white popsicle sticks shown in those beautiful apricot and lemon verbena pops.